The "Transformer House explores the idea of operable walls that transforms the spatial qualities and quantities of a house. The Schroder House was investigated and critiqued, and was deduced that the house only transformed in the horizontal plain. The project aims to exceed the boundary of the Schroder House, where not only the walls are able to transform but the the floors and roof, that is the vertical plain, are also able to transform and would begin to also break through its physical boundaries, that is the wall. This project investigates this potential and how it can be applied to a dense residential scenario. In Sydney, with the population increasing, the demand for more residential buildings will also increase. By 2033, 770,000 new homes will be needed to accommodate this rise. The "Transformer House" when applied to an urban environment, the apartment modules begin to attach to each other and with the Transformer House able to break through the boundaries, a collision and a sharing of spaces is achieved, a social cluster is formed. For example a wall from apartment A begins to fold into apartment B, a share space is created. This will be investigated in Stage 2 of the project. In Collaboration with Vivian Ma. Precedent Analysis of the Schroder house which looks at the different combinations of room configuration through the sliding and rotating the operable walls. 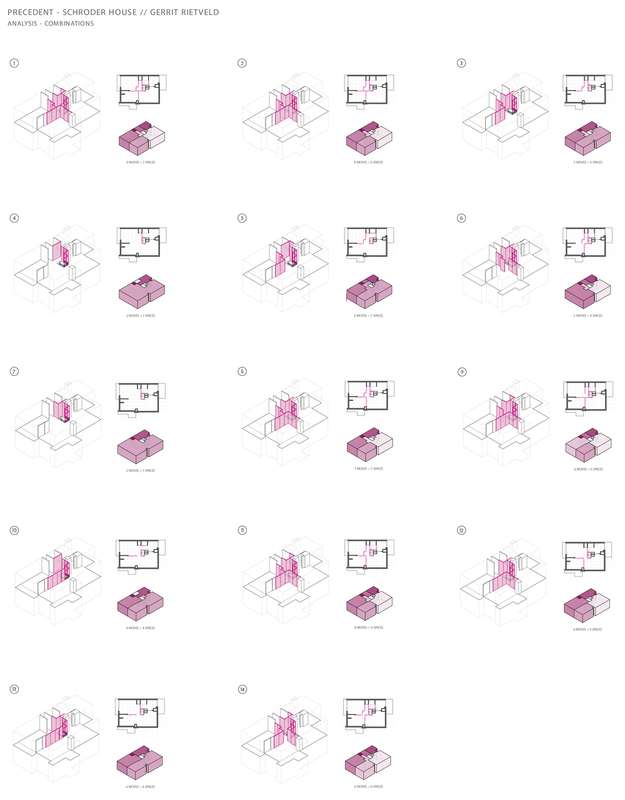 Tests, constraints and iterations of modules depending on the number of surfaces, number of potential turns and apartment sizes and form. Configuration of 3 of the 7 apartment modules that can be achieved. Project in the process of being updated.